It’s like a really wonky version of the 12 days of Christmas. There may be no such thing as a new idea but this is a very good not-new idea. Anything knit on 7mm needles is never going to take too long and this was no exception. The yarn is Arucania Limari and I used a skein and a smidge. Unlike my mermaid hat which is largely for show, this hat keeps your head warm and your ears toasty and I love it. 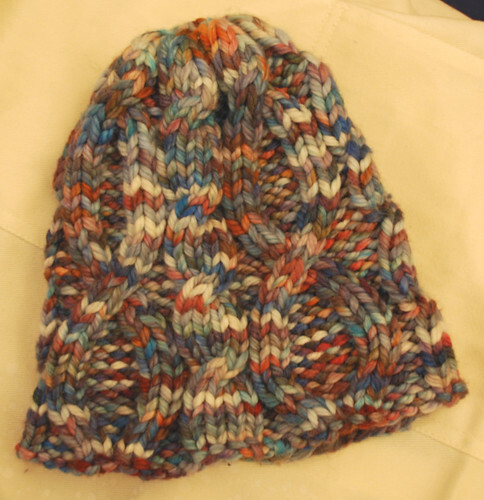 It even got positive comments from a non-knitting new acquaintance which suggests that either (a) it is a good hat or (b) she is open to being introduced to the ways of the wool. Clearly whilst the hat is good, the answer is (b). Poor girl, she won’t know what hit her. The biggest hit of the year for me has got to be my Icarus shawl – I have worn it almost to death, certainly it is starting to need a re-block, but I need to wait until I finish something else that can be shawl and scarf and comforter all in one. I wear that shawl tucked up on the sofa, as my scarf on frosty mornings and at work to protect against the chill creeping round the window frames. In the summer it was the perfect early evening cover up – small enough to squash into a handbag. In terms of knits that were given away, I like the Quarterpint cardigan jacket that I designed and knit for Mum and I think she does too. Of the 61 new projects finished (or mostly finished) this year, 35 have been gifts, so this has clearly been the year for knitting for friends and family, whether I realised it or not. If you get the right victims, knitting for family and friends is great (if I ever needed proof I just watch my husband showing off his hand knit socks) but hopefully next year there will be a few fewer babies to knit for, and a little more time to knit some bigger projects for me. Having said all of that there’s also quilting and spinning and …. and… life is good but it doesn’t get any less busy. Now then, before I can say “Roll on 2009”, I have a sock and a half to knit to complete the Christmas knitting – anyone think I can do it by midnight? Midnight? Carie, I have no doubt you’ll have done it by lunchtime. I am stunned! we are going to have to time how fast you knit one Tuesday evening.